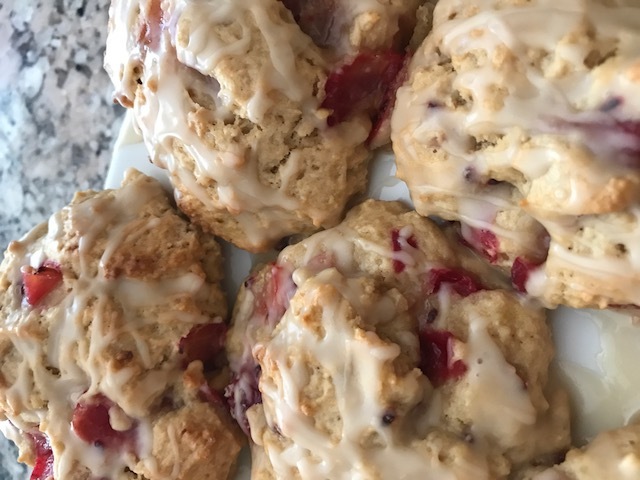 This light and fluffy scone recipe was created by FDC Member Julianna Thibodeaux, of the Marblehead Depot. If you still have some gooseberries left, toss them into this recipe. Otherwise, Julianna states that any seasonal fruit can be substituted, including this weeks blueberries from the Fruit Share. 3. In a separate bowl, beat egg and add milk. 4. Combine both mixtures just until mixed. Stir in gooseberries. 5. Spoon batter onto greased cookie sheet or baking stone. 6. Bake for 20-25 minutes, or until very slightly browned on top and/or edges. Add enough hot water to 1 cup powdered sugar to make drizzling consistency. Add 1 teaspoon maple glaze (optional). Vanilla works well too. Drizzle over warm scones and serve. This entry was posted in Member Stories, Recipes and tagged fresh scones, gooseberry scones, Member Recipe, scones by Jennifer Moore. Bookmark the permalink. These scones are TRULY HEAVENLY, and they’re easy to make! Don’t over-mix your wet and dry ingredients, it’s easy to do. And eat them while they’re hot; it’ll be so worth the morning carbs.